Valentine’s Day isn’t the only reason to celebrate in February; it’s also Chinese New Year, and romance be damned, this holiday is all about breakin’ out the buffet pants and tucking in. Seriously, have you seen what kind of eating goes on in Chinese restaurants this time of year? All over the world, around spinning lazy Susans, it’s a two-week non-stop food frenzy. We encourage you to get out there, and visit your nearest Chinatown, share the street with a dragon, be startled by fire crackers, elbow your way to a table and get your fair share of good luck and good eats. All the foods served and gifted on this holiday are symbolic—edible lucky charms—for prosperity, good health, and fertility. There’s raw and cooked fish dishes, noodles, taro and turnip cakes – one of my personal favourites! – steamed fruitcakes, pomelos, gourds, tangerines, and above all, dumplings. Dumplings formed to look like ingots of gold, and dumplings that resemble little purses, symbolically filled with good luck. And while I’m not convinced eating these delicate and delicious packages will bring us all good fortune, they will bring us double happiness, at least for a little while. 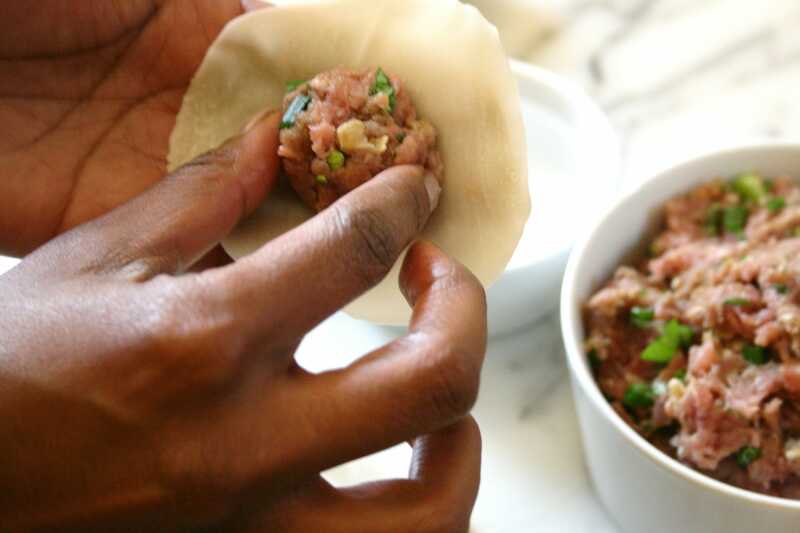 Making these addictive dumplings is so much easier than you might imagine. Follow my step by step instructions and any day can be Chinese New Year. 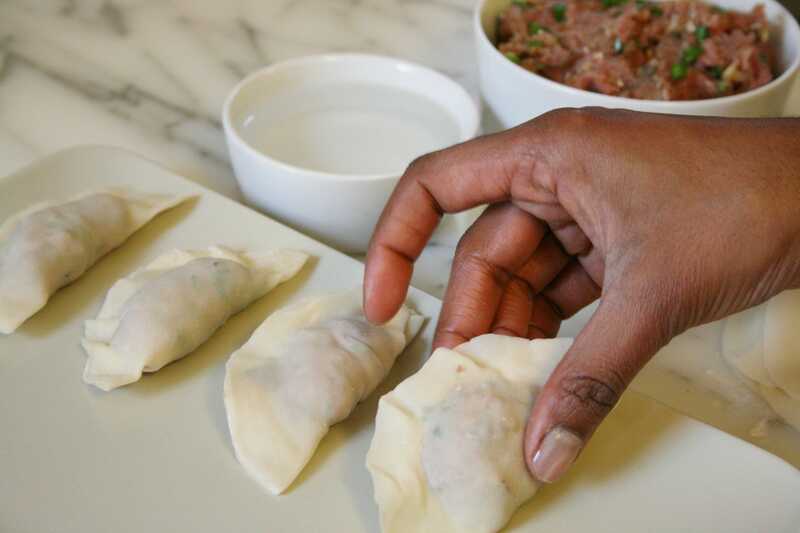 In honour of the Year of the Pig, these are made with local, small farm, heritage pork, but any meat or even finely minced fish or firm tofu will work too. For a super-fun party, assemble the gang at the kitchen island, set out the ingredients and start a production line…just add wine! 1. In a large, dry pan over medium heat, toast walnuts, stirring occasionally, until lightly brown, about 2 minutes; immediately transfer from pan to plate to cool. 2. In a large bowl combine pork, coriander, chive bud, cooled walnuts, garlic, galangal or ginger powder, white pepper and salt. 3. 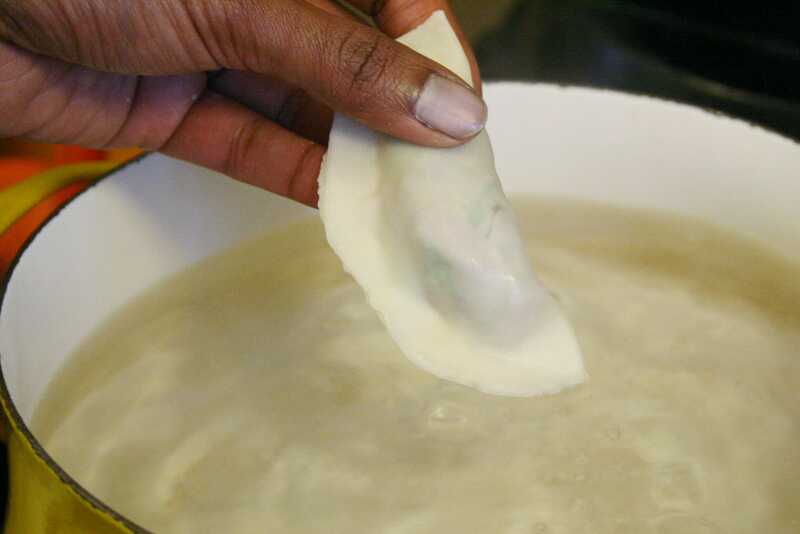 Take one dumpling wrapper and wet the rim lightly with water. 4. 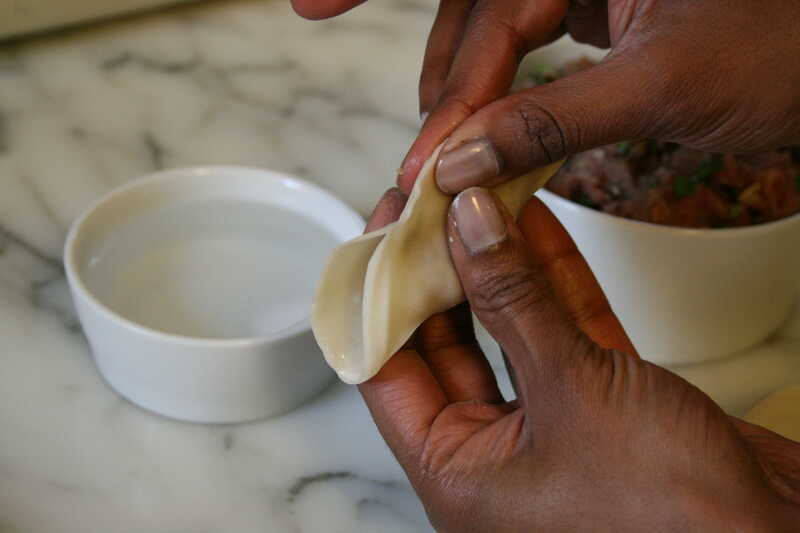 With the dumpling skin flat on one hand, place 1 Tbsp (15 mL) of the pork or turkey mixture in the centre. 5. 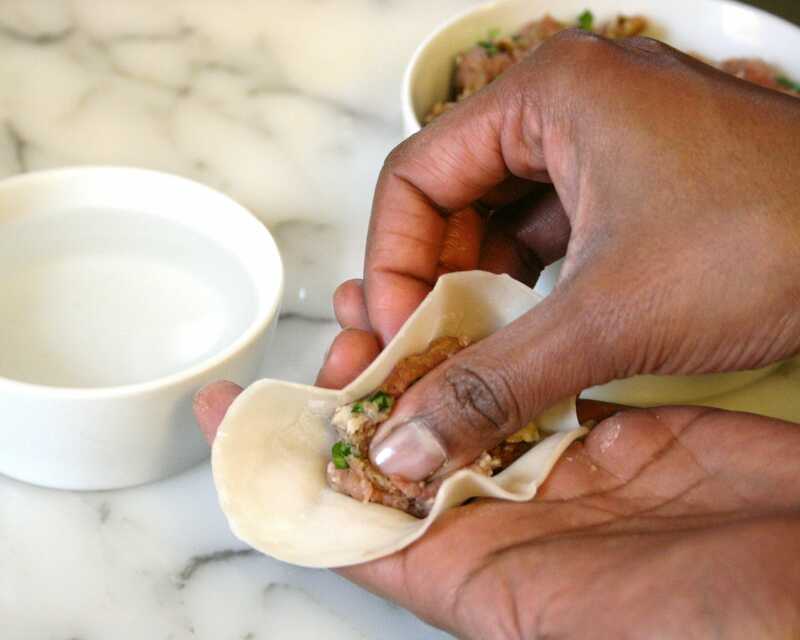 Fold the wrapper edge up into a taco shape and pinch tightly together; make extra sure there are no gaps! 6. 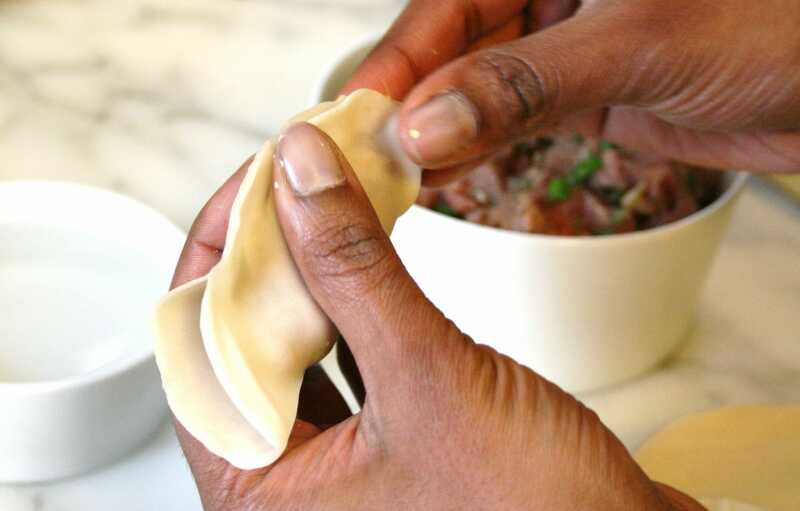 Bring a large pot of water to a boil, add the dumplings, a few at a time, then stir immediately and gently to make sure they don’t stick together or to the bottom of the pot. 7. 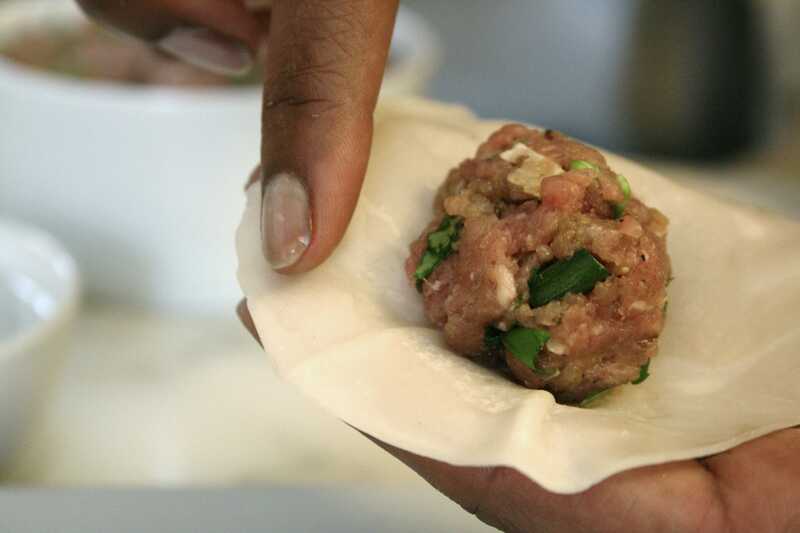 Cook until done, 5 to 7 minutes, or when the dumplings have floated to the surface and appear almost translucent. Remove with a slotted spoon and place on serving dish. 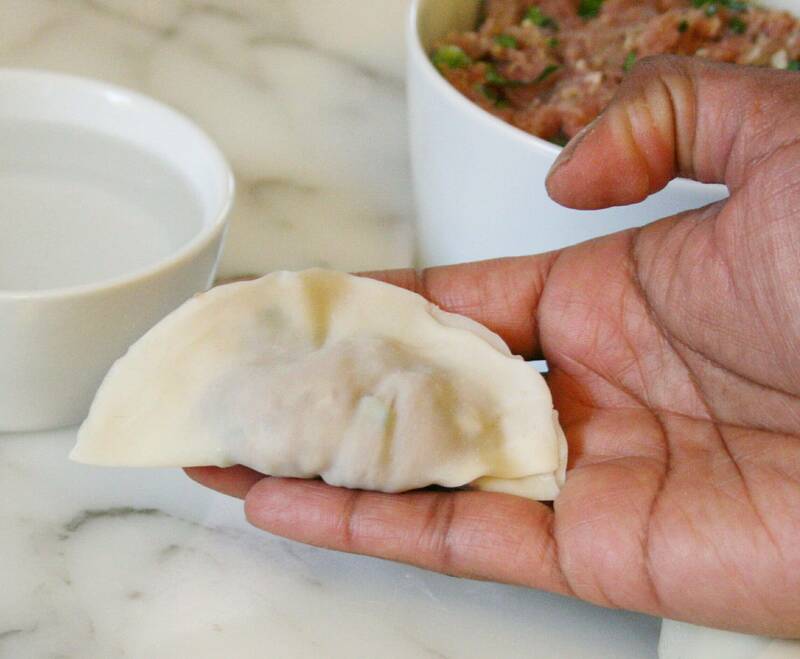 Do not overlap, as dumplings will stick together. 8. Serve with your favourite Asian sweet and spicy dipping sauce or float in a bowl of soup or stew for a heart-warming meal.